With 2018 LoL Worlds over, we’re now entering several months without a major League of Legends event to cover. StatXP covers the entirety of eSports and gaming but we’d like to keep our LoL coverage going. Inspired by FiveThirtyEight’s club soccer rankings, we’re going to spin our Elo model forward and keep a running ranking of professional LoL club teams. These rankings will be an expanded version of the Elo list we published throughout LoL worlds with two significant differences. One, we’re going to rank the top 25 teams in the world. We have rankings for all of the teams and may use them from time to time, but the figure below includes the top 25 teams. Additionally, we’ve made some improvements to the model based on experience with Worlds. The rest of this post is about the changes. But first, here are the inaugural StatXP LoL Top 25 Rankings. As expected, the world champions are a clear #1 in our rankings. Invictus Gaming was among the tournament favorites entering Worlds and they lived up to that expectation. Their thorough dismantling of Fnatic in the final was a surprise to us and it dropped FNC out of the number two spot down to number four. Despite the surprising NA and especially EU performance in the World knockout rounds, the top of our rankings are dominated by LPL and LCK teams. · Teams in the big five LoL leagues (LPL, LCK, LMS, NALCS, EULCS) start with 1625 Elo points and everyone else starts with 1550 points. We originally wanted to seed all the teams with the same points but major international competitions do not feature many teams outside of these leagues, so there is insufficient opportunity for superior leagues to “capture” Elo points for inferior ones. · At the end of every year, we regress every team’s Elo ranking back 25% towards their league’s starting Elo value. This idea comes from FiveThirtyEight and accounts for the tendency towards mean reversion. · To account for league disparity and the increased importance of international competitions, we weight each game’s significance. League games and playoffs are weighted 1, inter-league competitions like Rift Rivals are weighted 1.25, and international competitions like the Mid-Season Invitational and Worlds are weighted 1.75. · We’ve validated some of our modeling parameters a bit more. One of the key values of any Elo model is the K value, which is the amount of recency bias built into the model. Version 1 of our model used K=15 with a multiplier for margin of victory. Version 2 of the models uses a larger K value with multipliers for game significance and margin of victory. Due to the change in our margin of victory multiplier that is described below, this larger K value will still result in less recency bias than Version 1 of the model. 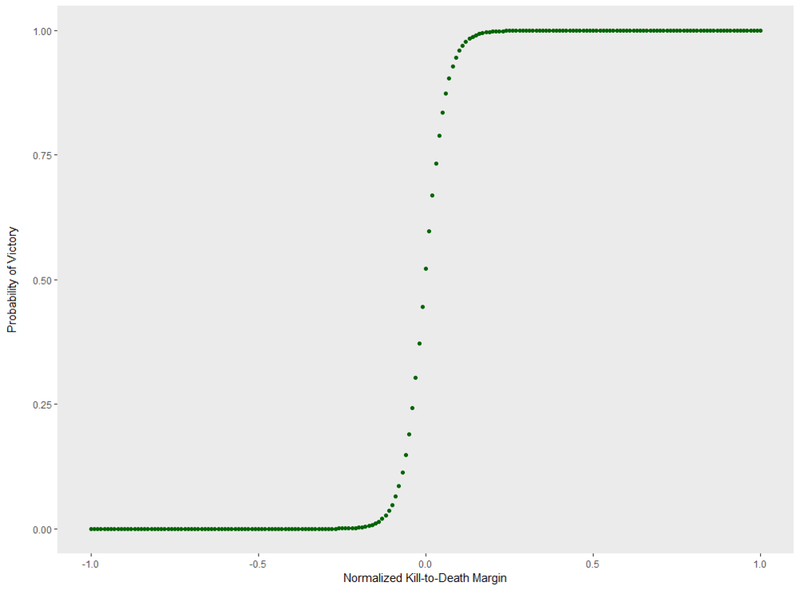 · Finally, we validated that kill-to-death margin is the best performance parameter to include in the model. A logistic regression with kill-to-death margin as the only independent variable accurately predicts a match’s outcomes 95% of the time. Incorporating other data, such as gold and tower kills, slightly improves the logistic regression’s accuracy but at these metrics do not fit into a margin of victory equation as easily. Still, our prior approach was overweighting the impact of margin of victory. Inspired by FiveThirtyEight’s basketball Elo model, we used the natural log of the absolute value of kills minus deaths to find the margin of victory multiplier. This equation decays so that a huge margin of victory does not cause too much of an Elo jump (since winning big and winning really big are both comfortable wins) but due to LoL’s low scoring compared to basketball, it doesn’t decay quick enough. For Version 2 of the model, we’ve normalized the margin of victory multiplier by the winner’s number of kills to reflect the fact that a 9 kills to 4 deaths win is much different than a 26 kills to 21 deaths win, even though they both have a margin of victory of 5 deaths. Had we used version 2 of the model at the beginning of the tournament, our predictions would have been similar but the odds would have been lower, indicating that there was no clear front-runner and the tournament was wide-open. We still would have missed by anointing Flash Wolves our favorite but we would have also agreed with betting markets by making Royal Never Give Up their co-favorite. Interestingly enough, version 2 of the model would have given surprise final four team G2 Esports the 7th best odds to win it all. We will continue to iterate on this Elo model and are planning to roll out similar models in out eSports going forward. Reader feedback and suggestions are certainly appreciated. We hope you enjoyed StatXP’s coverage of the 2018 LoL Worlds and we’re excited to bring you data-driven coverage from across the eSports and gaming worlds. Be sure to follow along with us on Twitter (@StatXP).